I ran into an old friend this morning at another friend's piano recital. This is someone I've known for almost fourteen years now, who's read a lot of my writing, from the really crappy stuff I wrote in high school to the not-quite-so-crappy stuff I've written in college. She mentioned a book she'd recently read about blogging, then added with a smile, "I thought you might be interested in, you know, people who write secret blogs and stuff." I laughed and asked how she knew--whether it was some detail of my life that I'd mentioned. She said it wasn't so much the details as the writing style. My voice, I guess. It was nice to chat with her, and reassuring to hear from someone who knows me so well that she recognized me from the way I write. I suppose my fear is that in accepting my mutant identity, I am becoming a different person, so I'll gladly accept evidence that I am fundamentally still the same me. 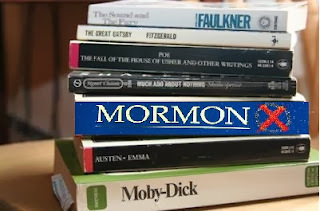 My friend also told me that she had seen my blog linked from a review of Mormon literature at the AML blog. The snooty English major in me wants to say, "Excuse me, sir, I know literature, and this blog is no literature," but the rest of me is just flattered to have people noticing me. I guess now I'll have to be more, like, literary and stuff. Are you impressed by my mad Photoshop skillz?